Bring style and functionality to your home with this versatile collection of square ottomans. These top-notch ottomans have symmetrical square shape in an array of captivating colors that compliment all types of room décor. 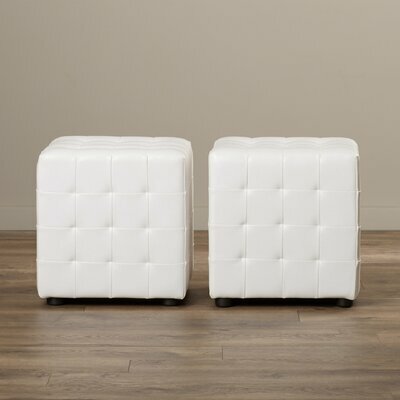 These square ottomans allow you to sit back and relax, store your items or use them as coffee table. Add comfortable seating and storage space to your home with the versatile and multi-purpose Simplify Single Folding Ottoman. Faux leather upholstery adds a charming appeal to its overall look. It features a removable lid that lifts to reveal a storage compartment where you can store your items. If you want to store this ottoman, you can fold it flat to save the space. Available in a variety of colors, this ottoman will compliment an array of room decors. Wood frame with faux leather upholstery. 1.5 cubic feet storage compartment for storing your items. Also available in multiple colors including Chocolate, Gray, Ivory, Lime, Purple, Red, Camel and Espresso. Comfortable seat is cushioned with polyurethane and foam. For easy storage, fold it flat when not in use. Maximum weight capacity: 200 pounds. The Storage Ottoman by Dorel Living offers you both comfort and extra storage space with style. It features faux leather upholstery with a plush seat for maximum comfort and convenience. The lift-up top reveals a hidden storage space where you can store your items such as books, toys, magazines, pillow covers or shoes. Storage space for storing your personal items. Sturdy wooden frame wrapped in faux leather. It also comes in appealing espresso finish. Rests on black wooden feet. Maximum weight capacity: 50 pounds. Featuring cream colored plush velvet upholstery accented with glimmering silver nailhead trim, the stylish Weybossett Ottoman adorns your room with classic glamour. Its square shaped and curved cross base look chic and trendy. You can place it in any room of your house to use it as an extra seating space. Place it in your bedroom, master bath, and entryway or as a bench/stool for your dressing table. Frame is crafted from pine wood and plywood for long lasting durability. Soft and plush velvet upholstery. Accented with silver nail head trim. 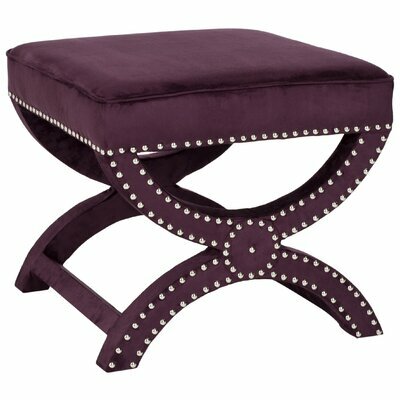 This gorgeous ottoman is also available in granite, pewter grey, purple grape, taupe, Wedgewood blue and yellow color. Granite, pewter grey, purple grape colored ottoman are upholstered in velvet while Wedgewood blue ottoman is upholstered in cotton. Base and legs feature curved X-design. Maximum weight limit of this ottoman is 50 pounds. Ready to install; does not require any assembly. If you are looking for functionality and utility value without compromising on aesthetic appeal, the Brayden Studio Storage Ottoman is a fantastic choice for you. Quintessential of modern styling, this ottoman has distinct and stylish square design is a quintessential of modern styling. It features sturdy frame crafted from premium caliber wood that promises amazing durability with excellent strength. Ideal for seating and storing, this ottoman is available in multiple pleasant colors. Sturdy wood frame with espresso finished legs. Great seating and storage solution. Cushioned top serves as a comfortable seat. Storage space below the seat. Reverse the top to reveal a convenient serving tray. Ideal for family room or living room. Upholstered in durable and soft-to-touch microfiber upholstery. Also comes in cream, eggplant, green, red, yellow and black color. Maximum weight capacity: 250 pounds. Manufacturer provides 1 year limited standard warranty. 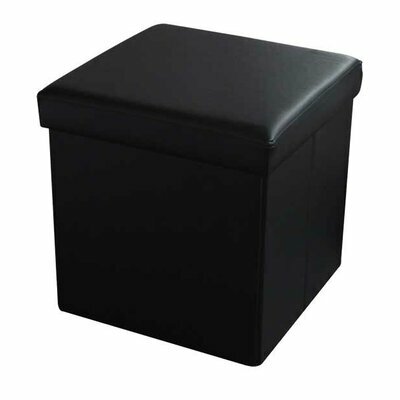 Designed for contemporary home, the Scorpius Cube Ottoman is perfect for both your home and office. 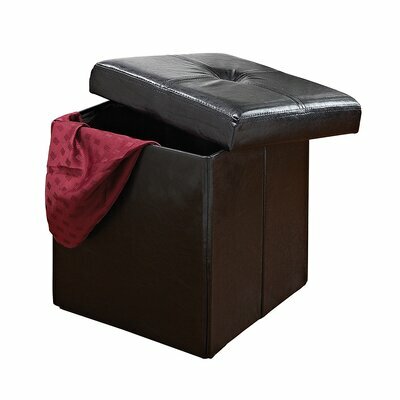 Sure to last long, this ottoman features lift-top storage space for keeping books, magazines or toys. It is perfect for cozy seating while putting on your shoes or you can also rest your feet on it after a long tiring day. Part of Latitude Run, this versatile ottoman has wooden frame and polyurethane foam padding with faux leather upholstery for long lasting comfortable seating. Dark brown bonded leather upholstery. Tufted seat padded with polyurethane foam. Storage space beneath the seat. Maximum weight capacity: 100 pounds. Product care: Use a dry or slightly damp cloth to wipe it clean. 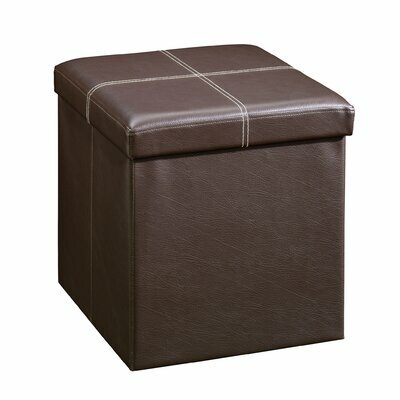 Functional and elegant, the Home Basics Storage Ottoman will be an excellent and valuable addition to your home. Its modern styling and cube design are very pleasing to the eyes. You can place it in any corner of your home including living room, bedroom, kid’s room or even entryway. It features wooden frame crafted from top drawer wood that promises years of flawless service. Home Basics Storage Ottoman Collection. Wrapped in durable and easy-to-clean faux leather upholstery. Also available in blue, brown and grey color. Unfold it in seconds for immediate seating and storage options. Multi-purpose space-saving design help you reduce household clutter. Ideal for storing magazines, your kid’s toys, gaming accessories or shoes. Easy-to-store ottoman, folds to a quarter of its size. Manufacturer’s 1 year limited warranty. 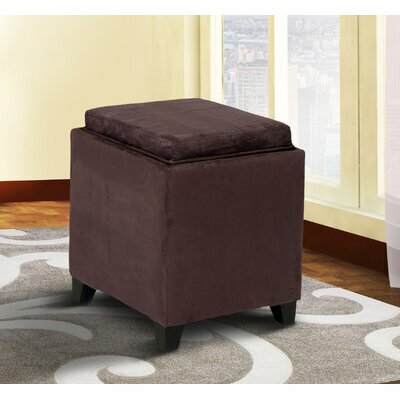 Add a stylish appeal to your room décor with the sophisticated Richlands Cube Ottoman. Crafted from manufactured wood, this elegantly designed set of ottoman is robust and long lasting. It features bright white faux leather upholstery that will brighten up your room with its radiant glow. For a luxurious and chic look, this set of ottoman is fully accentuated with subtle tufts. This flawless set is perfect for seating comfortably in your family room, living room, or guest’s room. Manufactured wood frame for maximum durability. Foam padding for comfortable seating. Durable faux leather upholstery for lasting style and chic look. Neat tailoring details with subtle tufts. Also comes in gorgeous black, dark brown and red colors. Fabric-lined bottom for a finished look. Rests on black plastic legs. Suitable for residential use only. Product care: Dry immediately after cleaning it with a damp cloth. 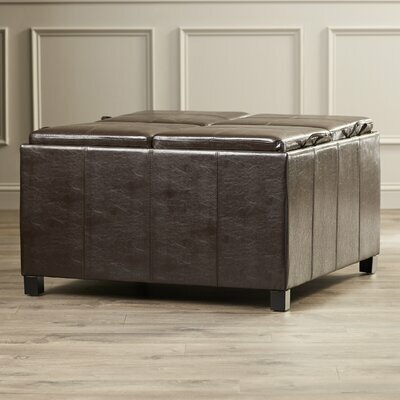 Unprecedented in quality, functionality and elegance, the Gerardo Upholstered Storage Cube Ottoman is perfect for your contemporary themed home. 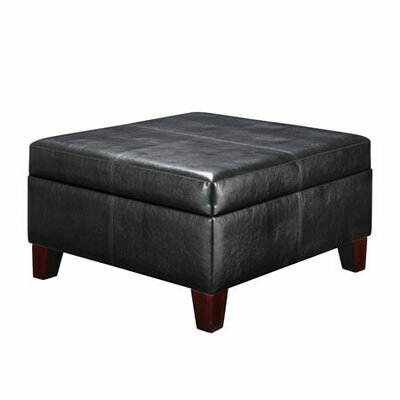 Crafted from top-notch materials, this ottoman features DuraPlush faux leather upholstery and sturdy frame to ensure long-term service with durability and strength. Part of Gerardo collection, this ottoman has cubic shape and it comes with a lift-off lid. This versatile ottoman has high practicality and promises comfortable seating and spacious storage space. Keep your household clutter free by storing your less used items in it. This ottoman is lightweight that allows you to move it from room to room with absolutely no difficulty. This ottoman features lift-off lid. Storage space available for keeping books, magazines or toys. Upholstered in DuraPlush, faux leather. Also comes in attractive black color. Non-toxic; safe for kids and your pets. Collapsible for quick and easy storing. Maximum weight limit of this ottoman is 150 pounds. Manufacturer provides 1 year limited warranty. Product care: Use a damp cloth to clean it. The elegant and simple Zipcode Design Marla 3 Piece Storage Ottoman Set is sure to impress your family with its looks and functionality. The set includes two ottomans; one small and one large. 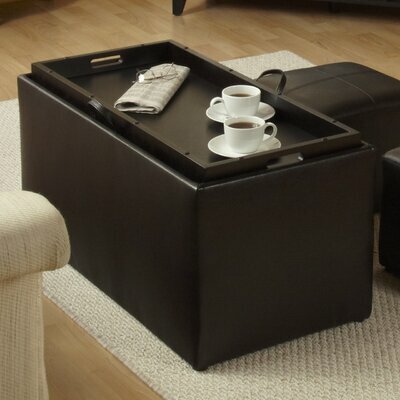 Now you can sit comfortably, store your items and utilize this ottoman as a coffee table. The larger ottoman features storage space below the lift-off lid. Reverse the lid to reveal a serving tray for placing your teacups or steaming coffee mugs.The small ottoman is plush and serves best as a stool or resting your feet after a hectic and tiresome day. The black faux leather upholstery gives this stet a charming appeal which is further accented by decorative stitching details. Zipcode Design Ottoman Set Collection. One large and one small ottoman. Includes serving tray made from painted wood. Solid wood frame construction for long lasting durability. Durable and beautiful black colored faux leather upholstery. Elegant and decorative stitching details. Compliments a wide range of room decor. Rests on matching black colored plastic legs. Maximum weight capacity of large ottoman: 50 pounds. Maximum weight capacity of small ottoman: 30 pounds. Ready to use; assembly not required. Product care: Use a dry cloth to clean it. 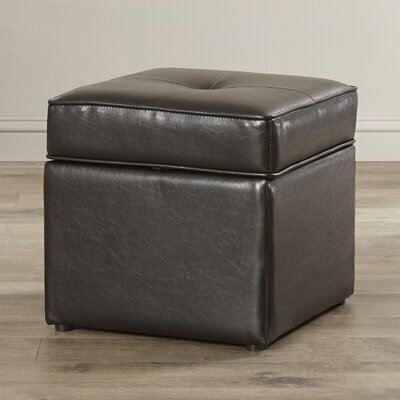 Create a stunning seating arrangement with the stunning and luxurious look of Sutton Cocktail Storage Ottoman. It is wrapped in gorgeous brown faux leather upholstery in lovely espresso finish with stylish stitching details. This flawless beauty features spacious storage space hidden below four lift-off lids. You can store the gaming equipment of your kids inside it or their toys. Flip over the lids and now you have four serving trays for a perfect coffee table. This multi-functional ottoman not only looks appealing but also saves space. Great seating and storage solution for a clutter-free household. Spacious storage compartment beneath the top. Flip over the top to reveal serving trays. Covered in durable faux leather upholstery. Brown color with espresso finish. Accented with decorative stitching detail. Round edges make is perfect for a home with toddlers. Compliments almost all types of room decor. Non-toxic and safe for kids and pets. Black colored plastic legs support the ottoman. Product care: Clean with a dry cloth.